1. Cut tortillas into squares and place pieces into a tray. 2. Bring tray into oven 350°F for 10 min or until the pieces turning golden. 3. Remove tray from oven and set pieces aside to cool down. 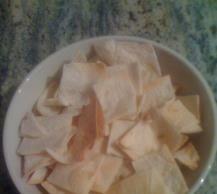 Serve tortilla chips with cheese dip, or you can eat plain. It is crunch is good.